The discussion at yesterday’s Wichita City Council meeting provided an opportunity for citizens to discover the difference in the thinking of the political class and those who value limited government and capitalism. At issue was Mid-Continent Instruments, Inc., which asked the city for a forgivable loan of $10,000. It received the same last week from Sedgwick County. According to city documents, the State of Kansas through its Department of Commerce is also contributing $503,055 in forgivable loans, sales tax exemptions, training grants, and tax credits. At the city council meeting Clinton Coen, a young man who ran for city council earlier this year, spoke against this measure, which he called corporate welfare. In response to Coen, Council Member James Clendenin (district 3, south and southeast Wichita) asked if we should ignore companies that want to do business here, or should we allow them to leave? Implicit in the question is that the threat dangled by Mid-Continent is real: that unless the city gives them $10,000, they will expand somewhere else. How citizens and council members feel about this issue largely depends on their perceived genuineness of this threat. When Coen recommended that the city cut spending, Clendenin said “I can guarantee you, from what I have seen, this city government has cut a tremendous amount of spending.” When pressed by Coen for examples of cuts, he demurred. Clendenin also said that the $10,000 is needed to show the city’s commitment to the company. In saying that, Layton is using the language and mind-set of bureaucrats and politicians. In this world, it’s a cut if spending does not rise as fast as planned or hoped for. As you can see from the accompanying chart, Wichita general fund spending has not been cut in recent years. It has risen in each of the last three years, and plans are for it to keep rising. This illustrates a divide between the thinking of the political class and regular people. Blurring the distinction between plans and reality lets politicians and bureaucrats present a fiscally responsible image — they cut the budget, after all — and increase spending at the same time. It’s a message that misinforms citizens about the important facts. Miller also praised the return on investment the city receives for its spending on economic development, citing Wichita State University Center for Economic Development and Business Research and the cost-benefit calculations it performs. These calculations take the cost of providing the incentives and compare it to the returns the city and other governmental entities receive. What is rarely mentioned, and what I think most people would be surprised to learn, is that the “returns” used in these calculations is manifested in the form of increased tax revenue. It’s not like in the private sector, where business firms attempt to increase their sales and profits by providing a product or service that people willingly buy. No, the city increases its revenue (we can’t call it profit) by collecting more taxes. It’s another difference between the political class and everyone else: The political class craves tax revenue. Aside from this, the cost-benefit calculations for the city don’t include the entire cost. The cost doesn’t include the county’s contribution, the majority of which comes from residents of its largest city, which is Wichita. Then, there’s the half-million in subsidy from the state, with a large portion of that paid for by the people of Wichita. But even if you believe these calculations, there’s the problem of right-sizing the investment. If an investment of $10,000 has such glowing returns — last week Sedgwick County Commissioner Jim Skelton called the decision a “no-brainer” — why can’t we invest more? If we really believe this investment is good, we should wonder why the city council and county commission are so timid. Since the applicant company is located in his district, Council Member Pete Meitzner (district 2, east Wichita), praised the company and the state’s incentives, and made a motion to approve the forgivable loan. All council members except Michael O’Donnell (district 4, south and southwest Wichita) voted yes. While the political class praises these subsidies and the companies that apply for them, not many are willing to confront the reality of the system we’re creating. Some, like O’Donnell and Sedgwick County Commissioner Richard Ranzau, have recognized that when government is seen as eager to grant these subsidies, it prompts other companies to apply. The lure of a subsidy may cause them to arrange their business affairs so as to conform — or appear to conform — to the guidelines government has for its various subsidy programs. Companies may do this without regard to underlying economic wisdom. We also need to recognize that besides simple greed for public money, businesses have another reason to apply for these subsidies: If a publicly-traded company doesn’t seek them, its shareholders would wonder why the company didn’t exercise its fiduciary duty to do so. But this just perpetuates the system, and so increasing amounts of economic development fall under the direction of government programs. While most people see this rise in corporate welfare as harmful — I call it a moral hazard — the political class is pleased with this arrangement. As Meitzner said in making his motion, he was proud that Wichita “won out” over the other city Mid-Continent Instruments considered moving to. Another harmful effect of these actions is to create a reputation for having an uncompetitive business environment. Not only must businesses of all types pay for the cost of these subsidies, some face direct competition by a government-subsidized competitor. This is the situation Wichita-area hotels face as a result of the city granting millions in subsidy to a hotel developer to build a Fairfield Inn downtown. Even those not in direct competition face increased costs as they attempt to hire labor, buy supplies, and seek access to capital in competition with government-subsidized firms. Could this uneven competitive landscape be a factor that business firms consider in deciding where to locate and invest? We can expect to see more government intervention in economic development and more corporate welfare. Former council member Sue Schlapp in April took a job with the Kansas Department of Commerce. Her job title is “senior constituent liaison,” which I think can be better described as “customer service agent for the corporate welfare state.” Her office is in Wichita city hall. Increasingly we see politicians and bureaucrats making decisions based on incorrect and misleading information, such as claiming that the city’s general fund budget has been cut when spending has increased. Sometimes they are fed incorrect information, as in the case of a presentation at Sedgwick County Commission that bordered on fraudulent. Sometimes, I think, officeholders just don’t care. It’s easiest to go along with the flow and not raise ripples. They participate in groundbreakings and get their photograph in the newspaper and on television that way. Which brings up an important question: why do none of our city’s mainstream media outlets report on these matters? Many people make campaign contributions to candidates whose ideals and goals they share. This is an important part of our political process. But when reading campaign finance reports for members of the Wichita City Council, one sees the same names appearing over and over, often making the maximum allowed contribution to candidates. Their spouses also contribute. Looking at the candidates these people contribute to, we find that often there’s no commonality to the political goals and ideals of the candidates. Some contribute equally to liberal and conservative council members. At first glance, it’s puzzling. But then, when these people appear in the news after having received money from the Wichita City Council, it snaps into place: These campaign donors are not donating to those whose ideals they agree with. They’re donating so they can line their own pockets. 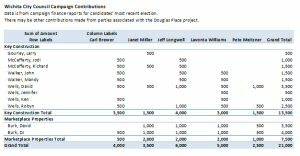 All told, parties associated with the proposed Douglas Place/Ambassador Hotel project contributed at least $24,500 to current city council members during their most recent campaigns. This is split between two groups of people: executives associated with Key Construction and their spouses, and David Burk and his wife. Those associated with Key Construction contributed $16,500, and the Burks contributed $8,000. At a recent city council meeting, Mayor Brewer, along with council members Janet Miller and Lavonta Williams expressed varying degrees of outrage that people would link their acceptance of campaign contributions with their votes and conduct as officeholders. But Burk and some others often make the maximum contribution to all — or nearly all — candidates, even those with widely varying political stances. How else can we explain Burk’s (and his wife’s) contributions to big-government liberals like Miller and Williams, and also to conservatives like Jeff Longwell, Pete Meitzner, and former council member Sue Schlapp? Burk and the others must be expecting something from these campaign contributions. There’s no other reasonable explanation. Candidates and officeholders who accept these contributions know that Burk and his business partners are likely to appear before the council asking for money. If they find this distasteful or repugnant, they could simply refuse to accept Burk’s contributions, as well as those from people associated with Key Construction. But they don’t. If Wichita had such a law, the city council couldn’t muster a quorum of its members to vote on the Douglas Place project, so pervasive are the campaign contributions. In Wichita city elections, individuals may contribute up to $500 to candidates, once during the primary election and again during the general election. As you can see in this table complied from Wichita City Council campaign finance reports, spouses often contribute as well. So it’s not uncommon to see the David and DJ Burk family contribute $2,000 to a candidate for their primary and general election campaigns. That’s a significant sum for a city council district election campaign cycle. Click here for a compilation of campaign contributions made by those associated with the Douglas Place/Ambassador Hotel project. Council Member Jeff Longwell (district 5, west and northwest Wichita), in his second term as council member and with his heart set on becoming the next mayor, leads the pack in accepting campaign contributions from parties associated with the Douglas Place project. For his most recent election, he received $4,000 from parties associated with Key Construction, and $2,000 from David Burk and his wife. Total from parties associated with the Douglas Place project: $6,000. Council Member Lavonta Williams (district 1, northeast Wichita), who is also vice mayor, received $5,000 from parties associated with Douglas Place/Ambassador Hotel: $3,000 from parties associated with Key Construction, and $2,000 from David Burk and his wife. Wichita Mayor Carl Brewer received $5,000 from parties associated with Douglas Place/Ambassador Hotel: $4,500 from parties associated with Key Construction, and $500 DJ Burk, David Burk’s wife. Council Member Janet Miller (district 6, north central Wichita) received $3,500 during her 2009 election campaign from parties associated with Douglas Place/Ambassador Hotel: $1,500 from parties associated with Key Construction, and $2,000 from David Burk and his wife. For his 2011 election campaign, newly-elected Council Member Pete Meitzner (district 2, east Wichita) received $3,500 from parties associated with Douglas Place/Ambassador Hotel: $2,500 from parties associated with Key Construction, and $1,000 from David Burk and his wife. For his 2011 election campaign, newly-elected Council Member James Clendenin (district 3, southeast and south Wichita) received $1,500 from parties associated with Douglas Place/Ambassador Hotel: $1,000 from parties associated with Key Construction, and $500 from David Burk and his wife. This article has been updated to include information from campaign finance reports filed in January 2012. In a free society with a limited government, taxation should be restricted to being a way for government to raise funds to pay for services that all people benefit from. An example is police and fire protection. Even people who are opposed to taxation rationalize paying taxes that way. But in the city of Wichita, private tax policy is overtaking our city. The Douglas Place project, a downtown hotel to be considered tomorrow by the Wichita City Council, makes use of several of these private tax policy strategies. By private tax policy, I mean that the proceeds of a tax are used for the exclusive benefit of one person (or business firm), instead of used for the benefit of all. And in at least one case, private parties are being allowed to determine the city’s tax policy at their discretion. The taxes collected by this private tax policy is still collected under the pretense of government authority. But instead of going to pay for government — things like police, fire, and schools — the tax is collected for the exclusive benefit of one party, not the public. In Wichita and across Kansas, one example of taxation being used for the benefit of one person or business is the Community Improvement District (CID). Under this program, the business collects an extra tax that looks just like sales tax. Except — the proceeds of the extra CID tax are funneled back for the exclusive benefit of the people who own property in the district. The Douglas Place project is asking to collect an extra tax of two cents per dollar for its own benefit. CIDs are a threat to unsuspecting customers who likely won’t be aware of the extra tax they’ll be paying until after they complete their purchases, if at all. Wichita decided against disclosing to citizens the amount of tax they’ll be paying with signage on stores. Instead, the city settled for a sign that says nothing except to check a city website for information about CIDs. CIDs also present the City of Wichita as a high-tax place to live and do business. It’s a risk to our city’s reputation. Especially when you consider the Jeff Longwell strategy, which is that since these taxes are often used by hotels and other businesses that cater to visitors, Wichitans don’t pay them as much as do visitors. At least in the case of Douglas Place the city is being more upfront with its citizens. The charter ordinance requires a two-thirds vote of the city council for passage, a higher bar than in the past. And, the city isn’t borrowing money to give to the hotel. 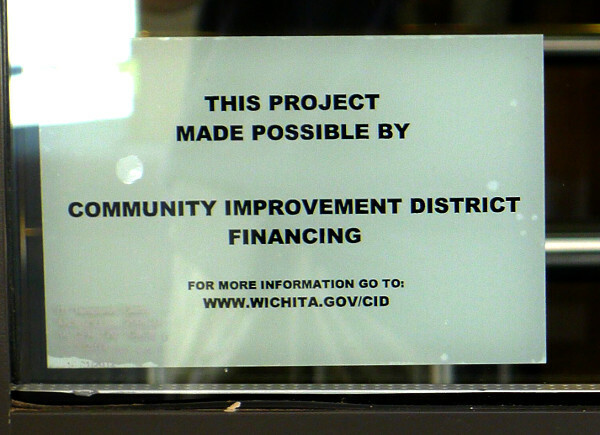 That’s what the city has done in the past, as in the case of the Fairfield Inn & Suites Wichita Downtown that is part of the WaterWalk project. One of the many layers of subsidy going in to that hotel was that the city simply gifted the hotel $2,500,000, to be paid back by the hotel’s guest tax receipts. Some will say that’s not really a gift, as the hotel will pay back the loan. But the loan is being repaid with taxes the hotel — more properly, its guests — must pay anyway. This is public taxation for private enrichment. If you need further evidence that the city is turning over taxation to private hands, consider this: The charter ordinance is subject to a protest petition, and if sufficient signatures are gathered, the city council would have to either overturn the ordinance or hold an election to let the people decide. In other words, the city is turning over to private interests the decision as to whether to have such an election. At least the citizens of Wichita won’t have to pay for it, if such an election happens. Another example of private tax policy that the Douglas Place project is using is Tax increment financing, or a TIF district. This mechanism routes property taxes back to the development. In the case of Douglas Place, $3,325,000 of its own property taxes are being used to pay for its parking garage. That’s a deal most citizens can’t get. Normally property taxes are used for the general operation of government. Not so in TIF districts, another example of public taxation for private enrichment. Again, these are taxes that the property must pay anyway. In Wichita, especially in downtown, we see the rise of private tax policy, that is, the taxation power of government being used for private purposes. This private tax policy is pushed by Wichita’s political entrepreneurs. These are the people who would rather compete in the realm of politics rather than in the market. Examples of Wichita’s political entrepreneurs include the developers of Douglas Place: David Burk of Marketplace Properties, and the principals of Key Construction. Competing in the political arena is easier than competing in the market. To win in the political arena, you only have to convince a majority of the legislative body that controls your situation. Once you’ve convinced them the power of government takes over, and the people at large are forced to transfer money to the political entrepreneurs. In other words, they must engage in transactions they would not elect to perform, if left to their own free will. In the free marketplace, however, entrepreneurs have to compete by offering products or services that people are willing to buy, free of coercion. That’s hard to do. But it’s the only way to gauge whether people really want what the entrepreneurs are selling. One of the ways that political entrepreneurs compete is by making campaign contributions, and the developers of Douglas Place have mastered this technique. Key Construction principles contributed $13,500 to Mayor Carl Brewer and four city council members during their most recent campaigns. Council Member Jeff Longwell alone received $4,000 of that sum, and he also accepted another $2,000 from managing member David Burk and his wife. All told, Burk and his wife contributed at least $7,500 to city council candidates who will be voting whether to give Burk money. Burk and others routinely make the maximum contribution to all — or nearly all — candidates, even those with widely varying political stances. How can someone explain Burk’s (and his wife’s) contributions to liberals like Miller and Williams, and also to conservatives like Longwell, Meitzner, and former council member Sue Schlapp? The answer is: Burk will be asking these people for money. Wichitans need to rise against these political entrepreneurs and their usurpation of a public function — taxation — for their own benefit. The politicians and bureaucrats who enable this should realize they should be serving the public interest, not the narrow and private enrichment of the few at the cost of many. Yesterday’s meeting of the Wichita City Council revealed a council — except for one member — totally captured by special interests, to the point where the council, aided by city staff, used a narrow legal interpretation in order to circumvent a statutorily required public hearing process. 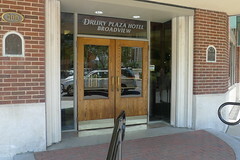 The issue was a downtown hotel to be developed by a team lead by David Burk of Marketplace Properties. The subsidies Burk wants, specifically tax increment financing (TIF), require a public hearing to be held. The city scheduled the hearing for September 13th. That schedule, however, didn’t suit Burk. In order to provide him a certain comfort level, the council agreed to issue a letter of intent stating that the council intends to do the things that the public hearing is supposed to provide an opportunity for deliberation. I, along with others, contend that this action reduces the September 13th public hearing to a meaningless exercise. This action is not good government, and it’s not open and transparent government, despite the claims of Mayor Carl Brewer. It goes against our country’s principle of the rule of law, part of which holds that our laws are more important than any single person. Several times council members — and once city attorney Gary Rebenstorf — explained that the letter of intent is non-binding on either party. But: No matter what information is presented at the September public hearing, no matter how strong public opinion might be against the incentives involved, is there any real likelihood that the council would not proceed with this plan and its incentives, having already passed a letter of intent to do so? I think there is very little possibility of that. Persuasive arguments will be made that since the city issued a letter of intent, and since the developers may have already taken action based on that letter, it follows that the city is obligated to pass the plan. Otherwise, who would ever vest any meaning in a future letter of intent from this city? During the discussion, no one was able to explain adequately why a letter of intent — if it is non-binding and therefore does not commit the city — was asked for by the developers. Despite the lawyerly explanation of Rebenstorf and council members — including the mayor — the letter does have meaning. Practically, it has such a powerful meaning that it makes the holding of the public hearing on September 13th a mere charade, a meaningless exercise in futility. He added: “If the council were to say, for instance, there were two or three pieces of that that you had discomfort with, that would then put everyone on notice that the deal may not go forward.” He said this is the purpose of today’s action, and he added that the action is non-binding. Astonishingly, the manger said while this is “not intended to be the normal process,” he said that he “kind of like it” as it gave an initial opportunity to gauge the sentiment of council members. I’m glad the manager didn’t mention the sentiment of the public, as with little notice as to the content of the deal and its incentives, citizens had no meaningful opportunity to prepare. An example of the contorted logic council members use to justify their action: Council Member Jeff Longwell (district 5, west and northwest Wichita) explained that issuing letters of intent is a common practice in real estate deals. He confused, however, agreements made between private parties and those where government is a party. Private parties can voluntarily enter into whatever agreements they want. But agreements with government are governed by laws. Yesterday, the city council announced its intent to do something for which it is required to hold a public hearing. That didn’t violate the letter of the law, but it certainly goes against its spirit and meaning. Longwell said he has no problem with that. Their bureaucratic enablers helped out, too. Wichita Downtown Development Corporation President Jeff Fluhr, in his testimony, said we are working towards becoming a “city of distinction.” That we are, indeed — a city distinguished by lack of respect for the rule of law and its disregard for citizens in favor of special interests. A few observations from the meeting follow. In response to a question from the mayor, Allen Bell, Wichita’s Director of Urban Development, said that the ratio of private dollars to public dollars for this project is about 2.2 to 1. Whether these numbers are correct is doubtful. It will take an analysis of the deal to determine the true numbers, and the details have been available for only a short time. But if correct, this ratio falls well short of the stated goals. Two years ago, when agitation for a new round of downtown planing started, boosters spoke of a ratio of 15 to 1. Eventually planners promised a ratio of 5 to 1 private to public investment for downtown. This project, while of course is just a single project and not the entirety of downtown development, doesn’t reach half that goal. Before that, Council Member Janet Miller (district 6, north central Wichita) claimed that there had been much media coverage of the proposed hotel, and that the public was actually getting two opportunities to talk about this project. She said that the media had published information about today’s meeting and the public hearing on September 13th. Miller is gravely mistaken. Until a Wichita Eagle article on Saturday, I saw no mention of the letter of intent, and no detail of the form of subsidies to be considered for this project. The city’s list of legal notices contains no mention of the action that was taken at this meeting. This Eagle article and a companion article went on to quote these people as having trouble with and being concerned, to varying degrees, with Burk’s acts: City Attorney Gary Rebenstorf; City Council member Jeff Longwell; City Council Member Lavonta Williams, now serving as vice mayor; then-Vice Mayor Jim Skelton, now on the Sedgwick County Commission; and City Manager Robert Layton. The manager’s quote is most directly damaging. Despite the fact that nearly all the property taxes Burk pays directly enriches himself and only him, he still doesn’t want to pay them. And according to the Wichita Eagle — not me — he engaged in deception in order to reduce them. 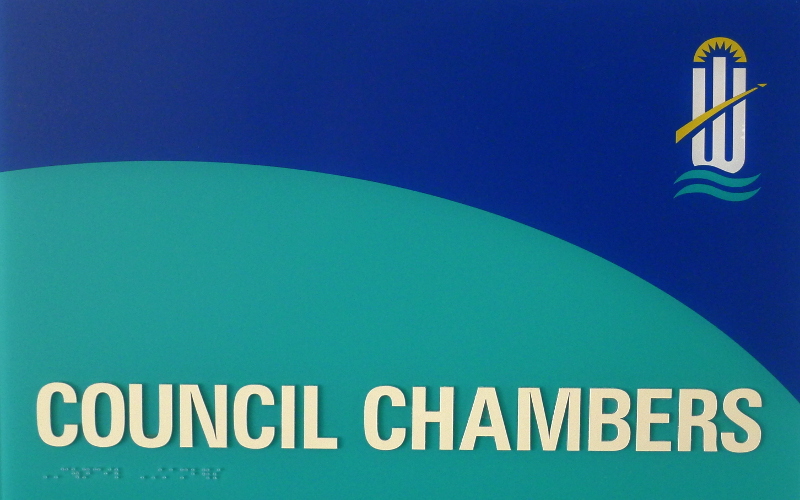 None of the four people in the council chambers — Rebenstorf, Longwell, Williams, and Layton — explained their apparent change of mind with regard to Burk’s acts. Burk, who addressed the council immediately after I asked if he cared to explain his actions, decided to avoid the issue. In his shoes, I probably would have done the same, as there is no justification for the acts the Eagle accused him of doing. He, and his political and bureaucratic enablers in Wichita city hall, have to hope this issue fades. Council member O’Donnell asked about a parking garage to be built at a cost of $6 million to the city: Will the city be putting this project out to competitive bid? Bell replied no, that is the developer’s request. City attorney Rebenstorf added that there is a charter ordinance that exempts these types of projects from bidding requirements. The company in question is Key Construction. Its principals regularly appear on campaign finance reports, making the maximum allowed contribution to a wide variety of candidates. Similarly, Burke and his wife also frequently make the maximum contribution to city hall candidates. O’Donnell is correct to publicize these contributions. They emit a foul odor. In our political system, many people make contributions to candidates whose ideology they agree with, be it conservative, liberal, or something else. But Burk and others routinely make the maximum contribution to all — or nearly all — candidates, even those with widely varying political stances. How can someone explain Burk’s (and his wife’s) contributions to liberals like Miller and Williams, and also to conservatives like Longwell, Meitzner, and former council member Sue Schlapp? The answer is that Schlapp and Longwell, despite their proclamations of fiscal conservatism, have shown themselves to be willing to vote for any form of developer welfare Burk and others have asked for. They create tangled webs of tortured logic to explain their votes. Meitzner, along with his fellow new council member James Clendenin (district 3, south and southeast Wichita), seems to be following the same path. Several council members and the mayor took exception to O’Donnell’s raising of this matter. Clendenin, for his part, objected and said that the public has had over 30 days to consider and take exception with this project. This contention, like Miller’s, isn’t supported by any facts that I am aware of. It appears that the first mention of any of the details of the plan and the subsidies is contained in a MAPC agenda that appears to have been created on July 29. Besides not being 30 days in advance, the MAPC agenda is an obscure place to release what Clendenin believes is adequate public notice. Regarding the issue of campaign contributions, the mayor — without mentioning his name — strongly criticized O’Donnell for bringing up this matter. Many people watching this meeting felt that the extreme reaction of Brewer and others to O’Donnell’s observation reveals a certain uneasiness regarding these contributions. I don’t believe the mayor and council members are taking illegal bribes, although when any city is enriching people with millions of dollars of developer welfare there is always that threat, and in some cities and states such practices are commonplace. The fact remains, however, that there is a small group of campaign contributors who — over and over — ask for and receive largess from city hall. 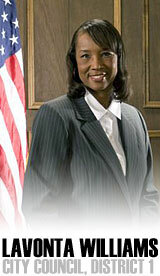 In his comments, Mayor Brewer accused opponents of providing only partial facts about matters, because the full facts did not support their case. He was referring to my remarks that a lawsuit brought against the city by a party who felt the city had reneged on a letter of intent was litigated all the way to the Kansas Supreme Court. In my remarks I didn’t mention who won that case — the city did — and the mayor believes this is an example of slanting the facts. 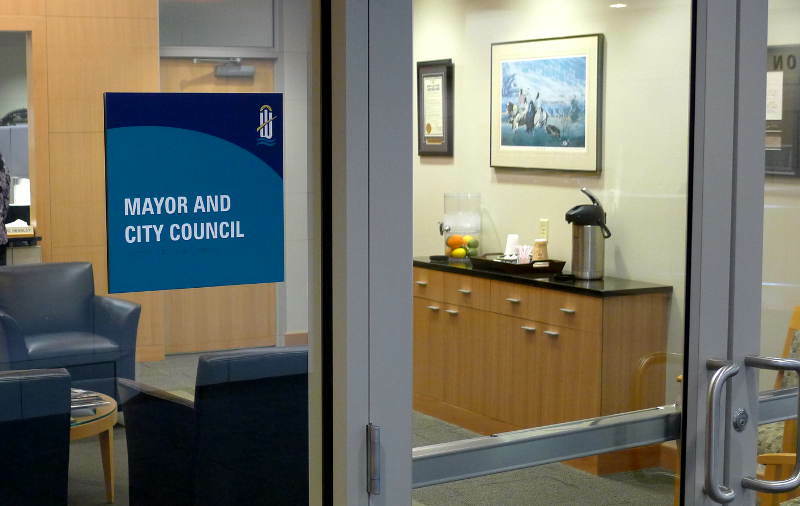 The mayor went on to make accusations of “grandstanding” from some of the public and “some council members” because there are cameras in the council chambers. He mentioned that news media are present at every meeting and that council meetings are broadcast on television. The mayor should take notice, however, that most people who care about public affairs and policy are severely disappointed with news media coverage of city hall events. The resources of news gathering agencies, especially newspapers, are severely depleted as compared to the past. In my coverage of a talk given by former Wichita Eagle editor Davis Merritt, I wrote this: “A question that I asked is whether the declining resources of the Wichita Eagle might create the danger that local government officials feel they can act under less scrutiny, or is this already happening? Merritt replied that this has been going on for some time. ‘The watchdog job of journalism is incredibly important and is terribly threatened.’ When all resources go to cover what must be covered — police, accidents, etc. — there isn’t anything left over to cover what should be covered. There are many important stories that aren’t being covered because the ‘boots aren’t on the street anymore,’ he said.” See Former Wichita Eagle editor addresses journalism, democracy, May 11, 2009. In addition, Bill Wilson, the reporter the Wichita Eagle sent to cover the meeting, has a documented bias against the concept of free markets, and against those who believe in them. The mayor, when delivering his criticism, does not use the names of those he criticizes. It would be useful if he did, but it would mean he has to take greater accountability for his remarks. Following are links to excerpts of testimony from the meeting — perhaps examples of the “grandstanding” the mayor complained about: John Todd, Shirley Koehn, and Bob Weeks. Local elections, qualifications of Wichita’s elected officials. On today’s edition of the KAKE Television public affairs program This Week in Kansas, Wichita State University’s Ken Ciboski, Chapman Rackaway of Fort Hays State University and myself join host Tim Brown to discuss local elections in Kansas. Mention was made of a recent article I wrote that was critical of the educational attainment of some Wichita City Council members. See Education gap on Wichita City Council. Steineger, Kansas senator, to address Pachyderms. This Friday (April 15) Kansas Senator Chris Steineger will speak to the members and guests of the Wichita Pachyderm Club on the topic “Using Business Principles to Restructure State and Local Government For Long-Term Efficiency.” Steineger, of Kansas City, has served in the Kansas Senate since 1997 and in December switched his affiliation from the Democratic to Republican party. 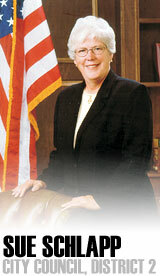 Steineger has voted with Republicans on fiscal issues for many years. Explaining why he switched parties, he wrote “I am a fiscal hawk who believes Americans have been borrowing, spending, and living beyond their means for too long.” Steineger has spoken at events organized by Americans for Prosperity. Soros conference online. This weekend’s conference of the Institute for New Economic thinking has quite a few papers and videos online at the conference’s website. Surprise: Keynes and his economic theories are revered. Attendees are treated to papers and presentations like this: “It is the interdependence between the rule of law and the production and distribution of goods and services that gives capitalism its unity. The autonomy of the economy is thus an illusion, as is its ability to self-regulate. And we are in the current mess because the scales have tipped slightly too far in favour of this illusion. This shift in the balance represents an inversion of values. Efficiency, it was believed, would be better served if the workings of governments were regulated more tightly (especially in Europe, although the theory originates in America) and if the markets were deregulated to a greater extent. The ingenuity of the financial markets initially, then their blind sightedness, did the rest.” … What? Economics in one lesson this Monday. On Monday (April 11), four videos based on Henry Hazlitt’s class work Economics in One Lesson will be shown in Wichita. The four topics included in Monday’s presentation will be The Lesson, The Broken Window, Public Works Means Taxes, and Credit Diverts Production. The event is Monday (April 11) at 7:00 pm to 8:30 pm at the Lionel D. Alford Library located at 3447 S. Meridian in Wichita. The library is just north of the I-235 exit on Meridian. The event’s sponsor is Americans for Prosperity, Kansas. For more information on this event contact John Todd at [email protected] or 316-312-7335, or Susan Estes, AFP Field Director at [email protected] or 316-681-4415. Wichita City Council this week. On Tuesday, the Wichita City Council considers only consent agenda items. Then, tributes — including video — to outgoing Council Members Paul Gray, Sue Schlapp, and Roger Smith and installation of new members. A new vice mayor will also be selected. … I don’t know if the city will be hosting a luncheon afterward. Two years ago a celebratory luncheon titled “Wichita City Council Changing of the Guard” cost over $1,000. Law, liberty, and the market symposium this week. This Friday (April 8) a symposium titled “Freedom, Liberty, and the Human Spirit” is offered in Wichita. The event is from 8:30 am to noon, in Alumni Auditorium in the Davis Administration Building on the campus of Friends University. The presenter is John R. Hays, Jr of Austin, Texas. The three sessions are titled Freedom’s not just another word for nothing left to lose; Who’s directing the show, and how can it possibly work without a director; and Markets, liberty, and economic progress. The event is free and open to the public, and attendees should reserve a seat by calling 316-295-5526. The sponsor for the symposium is the Fred C. and Mary R. Koch Foundation. Junket for Wichita lame ducks: the costs. Kim Hynes of KWCH Television reports on the expenses incurred by three lame duck Wichita City Council members to attend a training conference. It’s about $8,000. Particularly amusing — if it weren’t so sad — are the remarks made by Roger Smith as he attempts to justify attending a training conference when he — and the other two lame ducks Paul Gray and Sue Schlapp — will serve less than one month after returning from the conference. … It seems that some council members were not very careful with taxpayer funds when looking for airfares, as Gray spent $772.80 and Schlapp $688.80 on plane tickets. Several made the trip spending less than $400 on their ticket, and one for less than $300. Don’t we have a discount air carrier here in Wichita? … Deb Farris of KAKE Television reports, too. In her story Council Member Lavonta Williams and Mayor Carl Brewer attempt to justify the spending for the lame duck members. Wichita city council this week. There is no meeting of the Wichita City Council this week, as most members will be attending a meeting of the National League of Cities in Washington, DC. These conferences are designed to help council members be more effective. But for three of the council members that will be attending, their future service on the council is measured in days, not years. These three lame duck members — Sue Schlapp, Paul Gray, and Roger Smith — will be leaving the council in April when their terms end. Their participation in this conference, at taxpayer expense, is nothing more than a junket — for lame ducks. How attitudes can differ. At a recent forum of city council candidates, one candidate mentioned the five or six police officers conducting security screening of visitors seeking to enter Wichita city hall, recognizing that this doesn’t create a welcoming atmosphere for citizens. Vice Mayor Jeff Longwell said he thought the officers are “accommodating and welcoming.” It should be noted that Longwell carries a card that allows him to effortlessly enter city hall through turnstiles that bypass the screening that citizens endure. Further, it’s natural that the police officers are deferential to Longwell, just as most employees are to their bosses. … This attitude of Longwell is an example of just how removed elected officials can be from the citizens — and reality, too. Coupled with the closing of the city hall parking garage to citizens and the junket for lame ducks described above, the people of Wichita sense city hall elected officials and bureaucrats becoming increasingly removed from the concerns of the average person. Toward a free market in education. From The Objective Standard: “More and more Americans are coming to recognize the superiority of private schools over government-run or ‘public’ schools. Accordingly, many Americans are looking for ways to transform our government-laden education system into a thriving free market. As the laws of economics dictate, and as the better economists have demonstrated, under a free market the quality of education would soar, the range of options would expand, competition would abound, and prices would plummet. The question is: How do we get there from here?” Read more at Toward a Free Market in Education: School Vouchers or Tax Credits?. … This week in Kansas a committee will hold a hearing on HB 2367, known as the Kansas Education Liberty Act. This bill would implement a system of tax credits to support school choice, much like explained in the article. Are lottery tickets like a state-owned casino? This week a committee in the Kansas House of Representatives will hear testimony regarding HB 2340, which would, according to its fiscal note, “exempt from the statewide smoking ban any bar that is authorized to sell lottery tickets under the Kansas Lottery Act.” The reasoning is that since the statewide smoking ban doesn’t apply to casinos because it would lessen revenue flowing to the state from gaming, the state ought to allow smoking where lottery tickets are sold, as they too generate revenue for the state. Money, Banking and the Federal Reserve. This month’s meeting of the Wichita chapter of Americans for Prosperity, Kansas features a DVD presentation from the Ludwig von Mises Institute titled “Money, Banking and the Federal Reserve.” About the presentation: “Thomas Jefferson and Andrew Jackson understood “The Monster.” But to most Americans today, Federal Reserve is just a name on the dollar bill. They have no idea of what the central bank does to the economy, or to their own economic lives; of how and why it was founded and operates; or of the sound money and banking that could end the statism, inflation, and business cycles that the Fed generates.” The event is Monday (March 14) at 7:00 pm to 8:30 pm at the Lionel D. Alford Library located at 3447 S. Meridian in Wichita. The library is just north of the I-235 exit on Meridian. For more information on this event contact John Todd at [email protected] or 316-312-7335, or Susan Estes, AFP Field Director at [email protected] or 316-681-4415. Wichita-area legislators to meet public. Saturday (March 19th) members of the South-Central Kansas Legislative Delegation will meet with the public. The meeting will be at Derby City Hall, 611 Mulberry Road (click for map), starting at 9:00 am. Generally these meetings last for two hours. Then on April 23 — right before the “wrap-up session” — there will be another meeting at the Wichita State University Hughes Metropolitan Complex, 5015 E. 29th Street (at Oliver). Pompeo to meet with public. If you don’t get your fill of politics for the day after the meeting with state legislators, come meet with United States Representative Mike Pompeo, who is just completing two months in office. Pompeo will be holding a town hall meeting at Maize City Hall, 10100 W. Grady (click for map) starting at 1:00 pm on Saturday March 19th. Losing the brains race. Veronique de Rugy writing in Reason: “In November the Organization for Economic Cooperation and Development (OECD) released its Program for International Student Assessment scores, measuring educational achievement in 65 countries. The results are depressingly familiar: While students in many developed nations have been learning more and more over time, American 15-year-olds are stuck in the middle of the pack in many fundamental areas, including reading and math. Yet the United States is near the top in education spending.” … A solution is to introduce competition through markets in education: “Because of the lack of competition in the K–12 education system. Schooling in the United States is still based largely on residency; students remain tied to the neighborhood school regardless of how bad its performance may be. … With no need to convince students and parents to stay, schools in most districts lack the incentive to serve student needs or differentiate their product. To make matters worse, this lack of competition continues at the school level, where teacher hiring and firing decisions are stubbornly divorced from student performance, tied instead to funding levels and tenure.” The author notes that wealthy families already have school choice, as they can afford private schools or can afford to move to areas with public schools they think are better than the schools in most urban districts. Teachers unions explained. A supporter of the teachers unions is questioned about her belief that the unions need more money and power. In Kansas, the teachers union in the form of Kansas National Education Association (KNEA) and its affiliates consistently opposes any attempt at reform. This week outdoor retailer Cabela’s will ask the Wichita City Council to create a Community Improvement District (CID) for its benefit. Creating the CID would allow Cabela’s — the only store in the proposed CID — to collect tax of an additional 1.2 cents per dollar sales from customers. Proceeds of one cent per dollar, less a handling fee, will be given to Cabela’s for its exclusive use, with 0.2 cents per dollar to be used for street and highway improvements near the proposed CID. CIDs should be opposed as they turn over tax policy to the private sector. We should look at taxation as a way for government to raise funds to pay for services that all people benefit from. An example is police and fire protection. Even people who are opposed to taxation rationalize paying taxes that way. But CIDs turn tax policy over to the private sector for personal benefit. The money is collected under the pretense of government authority, but it is collected for the exclusive benefit of the owners of property in the CID. This is perhaps the worst aspect of CIDs. Landlord and merchants already have a way to generate revenue from their customers under free exchange: through the prices posted or advertised for their products, plus consumers’ awareness of the sales tax rates that prevail in a state, county, and city. The Wichita city council had a chance to provide transparency to shoppers by requiring merchants in CIDs to post signs informing shoppers of the amount of extra tax to be changed in the store. But CID advocates got the city council to back down from that requirement. CID advocates know how powerful information is, and they along with their allies on the city council realized that signage with disclosure would harm CID merchants. Council Member Sue Schlapp succinctly summarized the subterfuge that must accompany the CID tax when she said: “This is very simple: If you vote to have the tool, and then you vote to put something in it that makes the tool useless, it’s not even any point in having the vote, in my opinion.” She voted against the signage requirement. Cabela’s and its supporters note that part of the 1.2 cents per dollar extra tax to be charged will be used to improve the intersection at Greenwich and K-96. The need of an upgrade there should be questioned. A Cabela’s spokesman told the Wichita Eagle that easy access to the store from the highway is needed because shoppers “come in with the big pickups, the Rvs.” We should note that there exists a full-service intersection with traffic signals less than one mile from the Cabela’s site. For half of the distance, Greenwich road is three lanes in each direction. We also have to recognize the harmful effect of a subsidy granted to one company on its competitors. In this case, the city’s response is likely to be “let the competitors apply for a CID.” This pressure — where merchants of all types see other merchants benefiting from the state collecting taxes for their own benefit — is leading to “CID sprawl,” a term coined by Susan Estes. This accurately represents the natural result of the irresistible urge of the CID: charging your customers more and blaming it on the government. In particular, a major competitor to Cabela’s is Gander Mountain in the downtown WaterWalk development. This store benefits from taxpayer subsidy, and if it were to close, Wichita taxpayers would be liable for bond payments. Further, the store is considered an anchor for the struggling development. A closed store surely would not be good for WaterWalk’s future. Finally, Lynda Tyler, who is running for city council against current council member and Vice Mayor Jeff Longwell, wrote this letter which appeared in the Wichita Eagle. The questions she raises deserve answers. Is Cabela’s revenue estimate accurate? On the surface, the community improvement district for Cabela’s seems pretty simple: Those who shop at the store will help pay for the store and the K-96 on-ramps through an extra sales tax. But look at the numbers. The Eagle reported that the CID is expected to generate $17.2 million over 22 years (Feb. 16 Business Today). That means it would generate an average of $781,818 per year. At 1.2 cents per dollar of sales, the Wichita store would have to have yearly sales of $65.1 million per year. Cabela’s does not release its per store sales numbers, but according to an Aug. 23, 2007, Barron’s article, Cabela’s averaged about $348 in sales per square foot. On an 80,000-square-foot store, that would be $27.8 million of sales per year. That is less than half of the amount estimated for the Wichita store. If we issue general obligation bonds and build the ramps based on an inflated number, it would be the taxpayer who stands to lose. If the city also issues revenue bonds based on the inflated numbers, there could be a disaster, too, if the store does $26 million instead of $65 million in sales. Wichita-area legislators to meet public. Tomorrow members of the South-Central Kansas Legislative Delegation will meet with the public. Tomorrow’s meeting is in the Sunflower Room of the Sedgwick County Extension Education Center, 21st and Tyler Rd, at 9:00 am. Generally these meetings last for two hours. The first of these meetings, two weeks ago, was focused more on hearing the concerns of citizens rather than allowing legislators to speak a lot. … Two other meetings have been scheduled. One is on March 19th — right before the legislature adjourns for its break — at Derby City Hall, 611 Mulberry Road. Then on April 23 — right before the “wrap-up session” — at the Wichita State University Hughes Metropolitan Complex, 5015 E. 29th Street (at Oliver). This Week in Kansas. On This Week in Kansas Joe Aistrup of Kansas State University and co-author of of the new book on Kansas politics Kansas Politics and Government: The Clash of Political Cultures, Richard Schrock of Emporia State University and Education Frontlines, and myself join host Tim Brown to discuss immigration and abortion bills in Kansas, concealed carry on college campus, and public schools medicating students. This Week in Kansas airs on KAKE-TV channel 10 at 9:00 am Sunday. Brownback plan ignored in Wichita. At this week’s meeting of the Wichita City Council I explained to council members a few points of Kansas Governor Sam Brownback’s economic development plan and how several actions the council was considering were directly in opposition to that plan. No council member asked a question. No Wichita news media reported on how the council ignored the governor’s plan. Especially troubling is how the Wichita Eagle had two reporters attending the meeting, yet there was no mention in that newspaper as to how the council voted several times against the principles of the Brownback plan. … Especially puzzling are the votes of Sue Schlapp, who held a leadership role in the Brownback campaign. Video and more is here. National League of Cities junket defended. Speaking of Schlapp and other city council members, the Wichita Eagle printed a letter from the Executive Director of the National League of Cities defending the value of the conference for city council members. Fair enough. But the problem is that Wichita is sending council members to the conference who will serve less than one month after the conference. These council members — Sue Schlapp, Paul Gray, and Roger Smith — ought to refrain from spending taxpayer money on this trip, which is a junket for lame ducks. ACLU leader to speak in Wichita. On Friday (February 11) the speaker at the meeting of the Wichita Pachyderm Club will be Doug Bonney, who is Chief Council and Legal Director for the American Civil Liberties Union of Kansas and Western Missouri. His topic will be “150 Years of Kansas Liberty.” This speaking invitation has caused a bit of controversy, with some Pachyderm Club members — and non-members — criticizing the selection of a speaker whose group is associated with liberal political causes. But the invitation is in line with the club’s mission of political education, as stated on the national Pachyderm website: “To promote practical political education and the dissemination of information on our political system.” Previous speakers who don’t fit the club’s Republican Party affinity have included Democrats WSU political science professor Dr. Mel Kahn and Kansas school board member Dr. Walt Chappell, and Jack Cole of Law Enforcement Against Prohibition, whose mission is to end the war on drugs. All these speakers provided valuable information and education. The public is welcome and encouraged to attend Wichita Pachyderm meetings. For more information click on Wichita Pachyderm Club. Information added to KansasOpenGov.org. KansasOpenGov.org, a government transparency initiative provided by the Kansas Policy Institute, has added new sections of data to its offerings. Added this week are checkbook and payroll registers for school districts in Topeka, Wichita, Great Bend, Colby, and Pittsburg. An interesting observation: Wichita has two union stewards on the payroll. The Wichita school district says the cost of compensation, benefits, etc. are reimbursed by the union, but while serving as union employees, they continue to build up seniority and earn credit towards their taxpayer-funded pensions. More information from KPI is at More districts added — taxpayers have new tools. Economic development in Wichita explained. Maybe. You be the judge, as Wichita Mayor Carl Brewer and city council member Janet Miller explain. Video here. Limits on state agency advertising proposed. Kansas state treasurer Ron Estes has proposed a ban on appearances by elected officials in public service announcements using state resources 60 days before an election. This was an issue before last year’s election in November, mostly for the treasurer and secretary of state contests. Said Estes: “These public service announcements are intended to educate the citizens of Kansas on the programs available by the state to help serve their best interests. They are not intended to serve as a free campaign commercial for an incumbent before an election.” More information is here. After this issue is handled, I propose a next step: reigning in the agency websites, which functioned as campaign billboards for most elected state agency heads. On Tuesday (January 11) the Wichita City Council will decide whether to accept petitions calling for the formation of two Community Improvement Districts (CIDs) in Wichita. In both cases, city staff recommends that the council accept the petitions and set February first as the date for the public hearing. It is on that date that the council will accept public input and vote whether to form each of the CIDs. The districts proposed are two well-established Wichita shopping centers. Westway Shopping Center is at the southwest corner of West Pawnee Avenue and South Seneca Street. Eastgate Center is at the southeast corner of Kellogg and Rock Road. Both projects ask for one cent per dollar to be added to shoppers’ sales tax. Both ask to be implemented using the “pay-as-you-go” method, meaning that the city will not issue bonds. Instead, the city will send to the applicants the proceeds from the extra sales tax as it is collected. Both applicants are represented by Polsinelli Shughart, an Overland Park law firm that has represented other clients that have received approval for community improvement districts from the Wichita City Council. At the December 7, 2010 meeting of the Wichita City Council, the council considered whether stores in CIDs should be required to post signs warning shoppers of the amount of extra tax being charged. Some, including myself, feel that shoppers should have this information before deciding to shop in such a store. At the meeting Korb Maxwell, a representative of Polsinelli Shughart, spoke to the city council in support of the CID legislation. While Maxwell spoke as though he was advocating for the public interest, he in fact works for a law firm that is representing the narrow interests of its clients. He provided a suggested sign design that states that community improvement district financing was used, but not that customers will pay a higher sales tax in CID stores. Retailers would accept this, he said. I think this means that Longwell’s okay with telling people as they enter a store that they’re being taxed, but not how much tax they’re being asked to pay. We can summarize his attitude as this: Giving citizens too much information will confuse them. Schlapp understands and said what everyone knows: that if you arm citizens with knowledge of high taxes, they’re likely to go somewhere else. Mayor Brewer said he agreed with Schlapp and the other council members. This sign doesn’t mention anything about extra sales tax that customers of CID merchants will pay. Contrary to Schlapp’s assertions, this is not anything like government transparency. This episode is a startling example of the council and staff being totally captured by special interests. These two CIDs break new ground in that these shopping centers are not tourist destinations or trendy shops. Some council members like Longwell have justified past CIDs on the basis that since they are tourist destinations, much of the tax will be paid by visitors to Wichita. This is not a wise policy, but even it it was, it does not apply to these two shopping centers. Instead, these two applications are more indications that soon Wichita — its major retail centers and destinations, at least — is likely to be blanketed with community improvement districts charging up to an extra two cents per dollar sales tax. Currently, merchants in a CID are running the very real risk that once their customers become aware of the extra sales tax, they will shop somewhere else. But as CIDs become more prevalent in Wichita, this competitive disadvantage will disappear. Step by step, a sales tax increase is engulfing Wichita, and our city council and mayor are fine with that happening. This is on top of the statewide sales tax increase from last year, which, despite claims of its supporters and opposition by conservatives, is likely a permanent fixture. Earlier this year Robert Lawson appeared in Wichita to speak about economic freedom throughout the world. While the United States presently ranks well, that is changing. Writing this month in The Freeman, Lawson and his colleagues warn of dangerous trends — particularly the Obama Administration’s response to the recession — that pose a threat to the economic freedom that powers growth and prosperity. While the article is focused primarily at the national economy, there are lessons to be learned locally, too. In particular, increasing intervention into the state and local economy leads to compounding the loss of economic freedom. It is important to distinguish between market entrepreneurs and crony capitalists. Market entrepreneurs succeed by providing customers with better products, more reliable service, and lower prices than are available elsewhere. They succeed by creating wealth — by producing goods and services that are worth more than the value of the resources required for their production. Crony capitalists are different: They get ahead through subsidies, special tax breaks, regulatory favors, and other forms of political favoritism. Rather than providing consumers with better products at attractive prices, crony capitalists form an alliance with politicians. The crony capitalists provide the politicians with contributions, other political resources, and, in some cases, bribes in exchange for subsidies and regulations that give them an advantage relative to other firms. Rather than create wealth, crony capitalists form a coalition with political officials to plunder wealth from taxpayers and other citizens. We are now in the midst of a great debate between the proponents of limited government and open markets on the one hand and those favoring more collectivism and political direction of the economy on the other. The outcome of this debate will determine the future of both economic freedom and the prosperity of Americans and others throughout the world. In Wichita, “those favoring more collectivism and political direction of the economy” are winning. Not only are they winning the actual political votes, they are also winning the battles within their own minds. Astonishingly, many of the crony capitalists in Wichita have deluded themselves into believing that they are supporters of free markets and capitalism. But taxpayer-supported institutions like Wichita Downtown Development Corporation and Visioneering Wichita exist for the very purpose of directing taxpayer funds toward the crony capitalists. 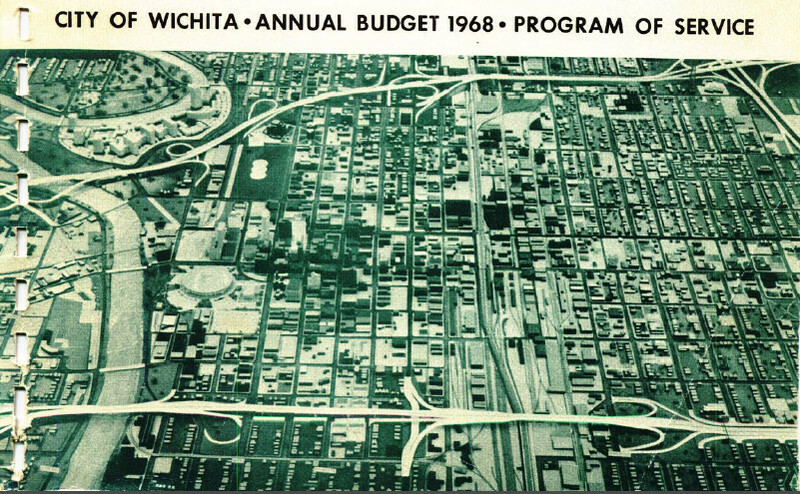 Even the Wichita Metro Chamber of Commerce plays a role in the plunder of the taxpayer, with its president nodding in approval as nominally conservative members of the Wichita City Council expressed their support for the collectivist, anti-market vision for downtown Wichita. The heads of each of these organizations, along with city council members Sue Schlapp, Paul Gray, Jim Skelton, and Vice Mayor Jeff Longwell consider themselves to be conservatives. Many of these have personally assured me they are in favor of free markets. The economic means of profiting involves voluntarily exchanging your goods or services for the goods or services of others. Parties will not voluntarily enter into an exchange unless they both believe they will be better off. Therefore, you can only profit over time in a system of voluntary exchange (a market) by making others better off. The political means of profiting transfers goods or services from one party to another by force or fraud. A coerced or fraudulent exchange leaves at least one of the parties worse off. Examples are stealing, committing fraud, polluting, using unsafe practices, filing baseless lawsuits, lobbying government to hamper competitors or obtain subsidies and promoting self-serving redistribution programs.